A little about the title of my blog. It is, of course, a line from a writer whose work went a long way to shaping the modern horror story, William Shakespeare. Now, there was an author that could craft a chilling tale. If you consider the psychological horror of Macbeth, the serial killer thriller of Richard III, the ghost story of Hamlet or the out and out splatter-fest of Titus Andronicus you realise that Shakespeare was a genre writer through and through (…ok, he liked to do the odd rom-com too, but we’ll forgive him that). I saw an RSC production of Titus Andronicus a year or so ago. So much blood! The stage was awash with it, to the point of the bespattered audience members in the front row complaining to the management about the damage done to their clothes, not expecting a gentle evening of high culture to end in a veritable bloodbath. Now then, this book isn’t actually from my own collection. Well, it sort of is….it sits on the shelves along with my collection. I’ve collected these horror paperbacks since I was around 10 years old. They fascinated me. I would pick them up from jumble sales whenever I found them (…or whenever I could afford them (times were ‘ard back then)). Anyway, skip forward ten years or so and I met the girl who was to become my wife. When I first walked into her bedroom her bookshelf stared me in the face…Peter Haining, Dennis Wheatley, Pan Horror, Fontana Ghosts…she had been collecting them since her childhood too! So this book rightly belongs to my wife, Samantha. I’ve just read that paragraph back to myself. A young man walks into the bedroom of a young lady for the first time and all he can do is obsess about her bookshelf………and that’s not even a euphemism! Well, you play the hand you’re dealt, I suppose. Edited by Lady Cynthia Asquith, this anthology was first published in hardback form by Hutchinson in 1931 and the stories included, although appearing in many anthologies in the following decades, would mostly have been first published here. It’s a classy line-up, Asquith usually stuck with a similar list of authors for her anthologies and, why not? When you can have a contents page like this, why go elsewhere? The highlights of this anthology for me are The Cotillon by L. P. Hartley and Our Feathered Friends by Philip MacDonald. Hartley is a master of portraying the dangerous subtext within passionate relationships, as in his novel The Go-Between, and he doesn’t disappoint here in this wonderfully gothic tale set during a masked dance in the middle of winter. 78 masked guests should be present at the dance but, after a sash window is discovered open with the snow blowing in, a 79th masked guest has arrived! MacDonald offers a very simple tale but tells it in such a hypnotic way it can’t fail to draw the reader in. MacDonald has a very cinematic writing style and uses it well here, at the opening of the story the reader is viewing the two characters as small parts in a panoramic landscape and as the tension increases he slowly pans us in closer and closer until we’re right on top of the action at the gruesome denouement. For anyone out there that’s new to early to mid-20th century supernatural fiction, you could do a lot worse than getting hold of Lady Cynthia’s anthologies. She breaks no new ground here, most of the authors are well established in their writing careers, but it is a good solid read nonetheless. Great piece, I wondered where you’d taken the name of your blog from as I have a great August Derleth anthology with the same title. Now I know so thanks for enlightening me. I’m planning a few horror/supernatural paperback blog posts in the near future too so I’ll be sure to include the Derleth title somewhere. You’re a lucky man to have a wife who shares your taste in literature. All the best. Thanks very much, I am a lucky man, indeed! 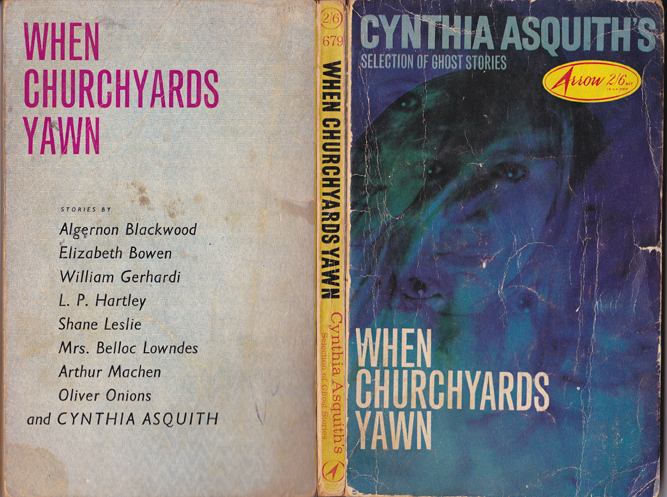 I think I know the Derleth anthology you mean, is it called When Graveyards Yawn rather than When Churchyards Yawn? I often wonder how or why they used graveyards instead of churchyards for that publication, perhaps just to avoid confusion with the Asquith anthology? Not sure, but I’ll certainly look forward to seeing your horror blog posts! All the best to you too. I’ve spent quite a bit of time looking for that volume this morning and it is indeed called “When Graveyards Yawn”, you beat me to on that one. I’m just getting ready to photograph a few more horror & supernatural books with some new kit I have, can’t have shoddy pics on the blog now can I? All the best. Nice! I don’t have a copy of it myself so looking forward to seeing it, my friend.